Several states recently passed legislation related to campus concealed carry. In one form or another, these laws allow students and campus employees with a concealed firearm permit to carry a gun on campus. These laws caused considerable concern among some. There are questions about good Samaritan laws and how those would apply. There are dire predictions about tragic events that would occur, and equally dire predictions about what would happen if we not allow concealed carry on campuses. Quite simply, the predicted chaos and carnage has not occurred. I generally take a middle-of-the-road stance on this highly emotional topic for some very pragmatic reasons. On one hand, there have been several campus shootings that have been stopped by citizens with guns: a high school dance shooting in Edenborough, Pennsylvania, a potential shooting at a university sorority dance Macon, Georgia, and the high school shooting in Pearl, Mississippi, to name a few. At the same time, I am not convinced that campus concealed carry would impact the overall numbers of shootings and victims that take place each year in educational facilities. The pressure to allow concealed carry will increase significantly if we continue to see mass casualty attacks with firearms and edged weapons by terrorists. This will be even more true if there are any more attacks on K12 and higher education targets. Educators in other countries like Israel, Thailand and Kenya are allowed to carry firearms as a response to school terrorism. We may see this evolve into a bigger discussion in the United States as well. Focusing on active shooter incidents can leave us unprepared for everyday events, particularly when it comes to campus concealed carry as a preparedness tactic. My primary concern a bit different than those often highlighted in media stories. I am concerned about the focus on extremely rare events like active shooter and active killer incidents. These types of risks are easy to focus on because they are so tragic when they do occur. I worry that people who carry a gun will train with a focus on neutralizing an active shooter. Their mental space is thus focused on an event that is statistically unlikely. 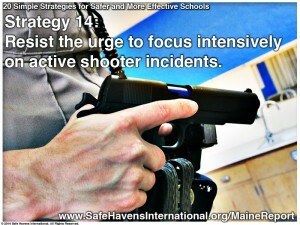 In reality, school staff will probably face a split-second use of force decision for a more mundane event. An intoxicated person waving a knife or an act of interpersonal violence will happen much more frequently. In schools, an active shooter situation is statistically less likely than many other situations that might prompt a use of force. Anyone who carries a gun for self-defense should be fully prepared to make the decision to take a human life – and not just in extreme situations. An addendum to our book Staying Alive that addresses the issue of deciding whether or not to carry a gun, or any weapon: Important Considerations for Carrying a Gun.